A close look at the even closer games. On Friday night, January 27th, Nathan Hale visited Garfield for a girls varsity and a boys varsity game. Garfield was clearly the more dominant team of the two. By the end of the first period, the Bulldogs were up 33-5, and the game ended with a final score of 84-33. Garfield senior Juanita Agosto scored the first point, and later scored 14 more. Sophomore Samiayah Tolliver had an strong first half with five three-pointers, and hit two more three-pointers during the third period (“My threes were on point!” said Tolliver after the game). Freshman Sah’Cari Davis and sophomore Jayla Howard both had hot nights on the court, scoring 12 and 10 points respectively. These impressive stats quantify the Bulldogs’ smooth playing style. The girls were balanced, communicative, and took their time to play at their own pace. This measured pace did occasionally translate into a lack of urgency on rebounds, but this didn’t kill the Garfield’s game. “Our strengths were that we worked together, and not going down to their level and playing at our level,” said Tolliver of the game. On Nathan Hale’s side, the majority of points were scored by Clara Hansen, #24. Hansen scored 14 points on Garfield, and 6 of these points came from penalties after being personally fouled. The game both began with and came down to aggression. Nathan Hale is not one of Garfield’s traditional rivals, yet the Hale fans were booed as they entered the gym. When Hale’s Michael Porter Jr., the #1 ranked player in the nation was announced, he was met with various jeers from the Garfield student section. While Porter is homeschooled, he has been playing for Hale this year since moving up from Missouri, due to his father’s signing as the men’s basketball assistant coach with the University of Washington. Coached by former-NBA player and Garfield alum Brandon Roy from the ashes of 3-18 record last year, Hale has become #1 in the nation. Their star-studded rise, including the acquisition of former Garfield player PJ Fuller (who was greeted with calls of “Traitor” from the Bulldog student section), has made a few enemies. Garfield, who is ranked second in the Metro league only to Hale, is one of these new rivals. As a fellow spectator put it, Friday night’s game was a game of all-stars. Garfield’s Daejon Davis, Jaylen Nowell and Hale’s Porter are the top three recruits committed to University of Washington together. They may be teammates in the future, but that night it was clear that they were not friends. Nathan Hale won the tipoff, but Garfield Junior J’Raan Brooks scored the first point. Brook’s first point was returned with an angry dunk by Michael Porter, one of many to come. In total, Porter scored 33 points over the course of the game. Brooks went on to score 18 more points, while Garfield’s Jaylen Nowell scored twenty, and Daejon Davis scored twelve. Throughout the first half, Hale was consistently ahead but Garfield followed close behind. The Bulldogs found a lead of 27-29 late in the second period, but lost this with a halftime score of 34-31. Hale pulled ahead after halftime, and ended the third period 53-44. The gap between points oscillated, growing and decreasing as Garfield’s playing ebbed and flowed. The Bulldogs managed to catch up to 64-60 with 1:20 left in the fourth period. In the end, it came down to aggression. Michael Porter was fouled three times in the last minute of the fourth quarter, sinking five easy points for Nathan Hale. 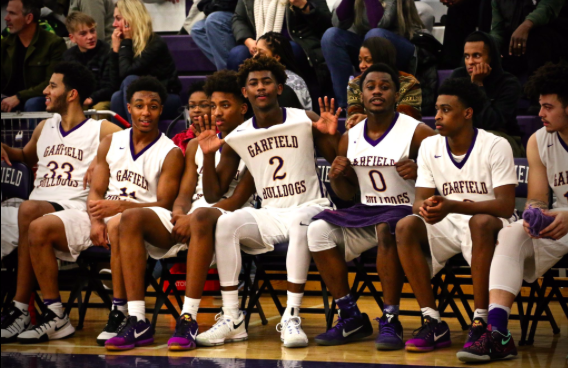 Nowell, who scored 10 points in the fourth quarter, fouled out, leaving Garfield without one of its top scorers. Hale skipped on ahead to win 69-65. On Friday, February 10th, the two teams are slated for yet another matchup in the Metro League Championships at Chief Sealth High School at 8 PM. Can’t make it? Follow @garfield_sports on Twitter to get the latest live updates of the game.